Designed specifically for the barber in mind, the Kato barber scissor set is a true work horse! Speed cutting is where this model excels while scissor over-comb work is a breeze creating clean straight lines! Hand crafted using the finest Aichi 440C steel from Japan. Designed specifically for the barber in mind, the Kato barber scissor set is a true work horse! Speed cutting is where this model excels while scissor over-comb work is a breeze creating clean straight lines! Hand crafted using the finest Hitachi 440C steel from Japan, these scissors and thinners are designed for the busy barber shop. Look after them and they’ll last between 15 and 20 years! Do you know that Matakki offer you a free drop warranty? Drop your scissors within the first 12 months and Matakki will service them for free (worth £30). Want to know what’s included in our Japanese sharpening service? Visit our servicing page for more information. 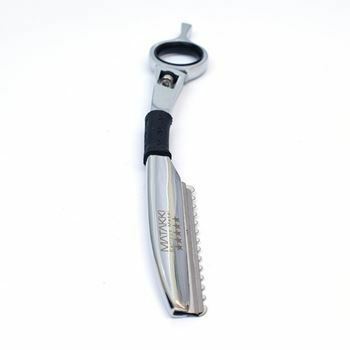 Designed specifically for the barber in mind, the Kato barber scissor is a true work horse! Speed cutting is where this model excels while scissor over-comb work is a breeze creating clean straight lines! Super smooth, amazingly sharp, superbly balanced when cutting and completed with a black gem tension screw for brisk and simple tension alteration. BEST SELLER...The Matakki Reaper is constructed from premium Japanese Hitachi 440C steel with a Rockwell Hardness of 62 which enables our technicians to create a super sharp convex cutting edge. How much are your used scissors worth? Deciding on new pair of scissors can be scary. Copyright © 2019 Matakki Scissors ®. All rights reserved.